Karyn A. McCreary Jakubowski is a partner at the law firm of Sullivan, Workman & Dee, LLP in Los Angeles. Ms. Jakubowski’s practice is primarily dedicated to eminent domain and real estate litigation, and has represented both condemning agencies and private property owners. Ms. Jakubowski has engaged in lease reviews, drafted purchase and sale agreements for real property transactions, coordinated escrows, reviewed and drafted leases, conducted due diligence regarding title disputes, litigated easement disputes, and litigated both commercial and residential landlord and tenant disputes. Ms. Jakubowski also represents clients in California employment litigation arising under the California Fair Employment and Housing Act and the California Labor Code. 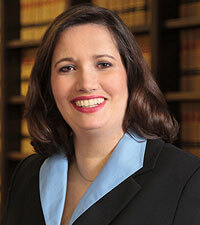 Ms. Jakubowski received her law degree from the University of Michigan Law School in 2003. She has been a member of the firm since July, 2003, and was elevated as a partner of the firm in 2006. Ms. Jakubowski is currently admitted to the State Bar of California, the United States District Court for the Central District of California and the United States District Court for the Southern District of California. She is a member of the American Bar Association, the San Diego County Bar Association, and previously served on the steering committee for the Eminent Domain and Inverse Condemnation Subsection of the Real Property Law Section of the California State Bar Association. Ms. Jakubowski has co-authored articles on the role of ethics in eminent domain for the CLE International Conference in Eminent Domain held annually in Los Angeles, California and served as a contributing author to the California State Bar Real Property Law Sections’ e-Bulletin. Ms. Jakubowski also served as a contributing author for volumes 8 through 10 of Nichols on Eminent Domain, the leading national treatise in the field of eminent domain. She has also been a guest lecturer at the University of La Verne College of Law and the Real Property Section for the Los Angeles County Bar Association.